Increased airflow on a warm day can make an outdoor space much more comfortable. 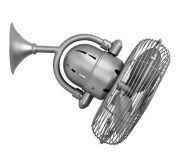 Rated either damp or wet, damp rated fans are ideal for covered outdoor areas. Wet rated fans can be used virtually anywhere and can handle direct rain. Make your patio an outdoor oasis with the cooling breeze of an exterior ceiling fan. Shop our huge selection of patio fans from modern, traditional or tropical and find the perfect outdoor ceiling fan. An outdoor ceiling fan is a wonderful way to extend your living space. By adding an exterior ceiling fan, you can better enjoy your outdoor living space with a cooling breeze, and a ceiling fan with a light can allow you to spend more time outdoors in the spring and fall when the sun isn't up until late at night. Patio fans are either rated damp or wet. Both are made to withstand the outdoor elements, but wet rated can tolerate direct rain or snow on them. Damp rated ceiling fans cannot have any direct water, so they are only appropriate for a well covered patio such as screened in porches or sunrooms. Wet rated fans are made with moisture resistant parts and all weather blades for direct exposure to rain or snow. 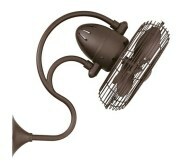 These are great for gazebos or patios where the fan may be exposed to direct water. 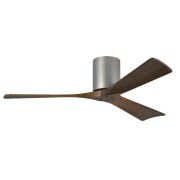 A popular wet rated ceiling fan is the Zonix Wet and Zonix Custom. The Zonix Custom has an LED version which allows you to add a light outdoors. Now that you know what a damp vs wet rating means, the fun part comes in discovering what type of ceiling fan you'd like to match your decor and express your style. Just like any ceiling fan, you will need to decide on the size of the fan. 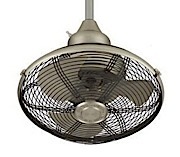 We have small outdoor fans in 44" diameter and large industrial fans 72" or larger. 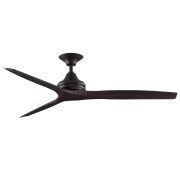 The Odyn 84" ceiling fan is a very popular large ceiling fan. 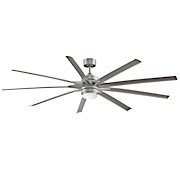 We have a large selection of contemporary ceiling fans and many tropical style ceiling fans as well. 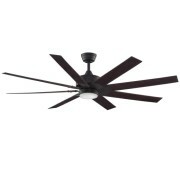 Popular tropical style fans include the Windpointe and Islander fans. We have many customers enjoy using our Modern Fan Company line outdoors such as the Plum, Altus and Cirrus Fans. 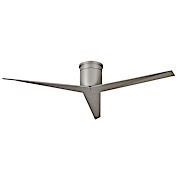 Hugger ceiling fans are also available for outdoor use, and these are a great choice for lower ceilings. 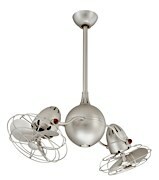 Popular flush mount ceiling fans include the Hugh 44" Fan and Hugh 52" Fan, Curva Sky 44" and 52" Fans, and the Irene 3 Hugger Fan, also available in 42" or 52" sizes.